Mostly cloudy early, then sunshine for the afternoon. High 67F. 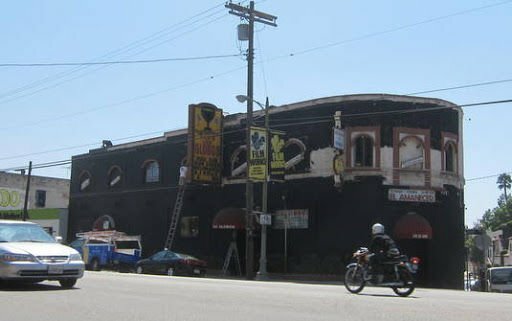 Winds S at 5 to 10 mph..
Club Los Globos, the Silver Lake nightclub that had long catered to a Latino clientele, today resembles a two-story high, stucco oil tanker as workers slap black paint across the Sunset Boulevard building. There has been a lot more changes inside, where work is still underway on the main floor. 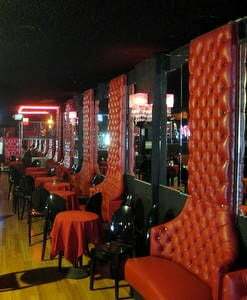 Meanwhile, upstairs, workers are putting the finishing touches on a black and red lounge that will tonight host a dance party and show by Glass Candy of Echo Park Records. It’s not clear if Echo Park Records bought the building on Sunset Boulevard at Vendome Street but it is involved in booking the space. The Eastsider has contacted Echo Park Records to find out who is running the place and who decided to paint the building black.